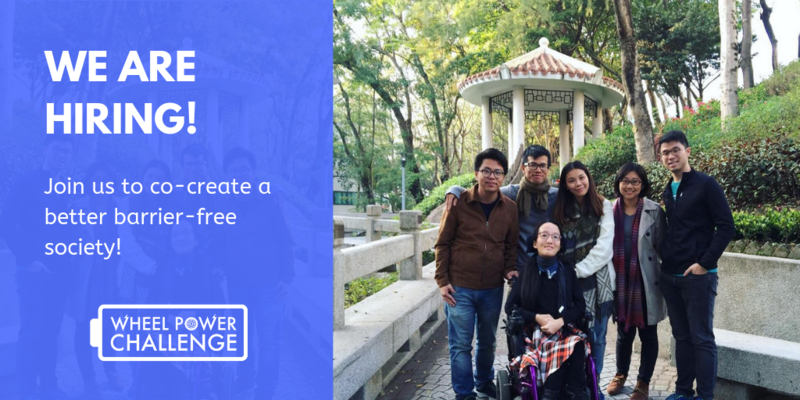 Established in 2014, Wheel Power Challenge is a non-profit organization entirely run by volunteers. Our aim is to foster co-creation of social inclusion and to raise the awareness of accessibility in our community environment. To facilitate the implementation of our programs (more info can be found following the job description), we are now recruiting a half-time Project Coordinator to be our first employee! We offer competitive remuneration, and flexible work arrangements such as flexi-time or work from home upon prior agreement. Perform various administrative duties as assigned. Applicants with disability are welcome to discuss with us any accessibility arrangements, e.g. for outdoor work. Interested applicants should submit cover letter and CV to us at <info@wheelpowerchallenge.org>. Review of applications will commence as soon as possible until the position is filled. Our signature program “Wheel We Meet?” offers opportunities to participants from all walks of life to experience our local communities and perform daily tasks from the perspective of wheelchair users. This activity also records and plots the architectural accessibility information on online maps for public reference. Our “Wheel We Hike?” program, in collaboration with TrailWatch and Oasistrek, explores and records barrier-free hiking routes so as to encourage wheelchair users to step out of their comfort zone and experience the nature. Following our beach-accessible wheelchair building experience two years ago, we are going to launch our “Wheel To Beach” program this Summer with the support from the SIE Fund and Impact Incubator, enabling wheelchair users to enjoy beach activities using accessible beach wheelchairs. Information provided from applicants will be treated in strict confidence and will be used for recruitment purpose only. Information of unsuccessful candidates will normally be destroyed 2 years after the recruitment exercise is completed.